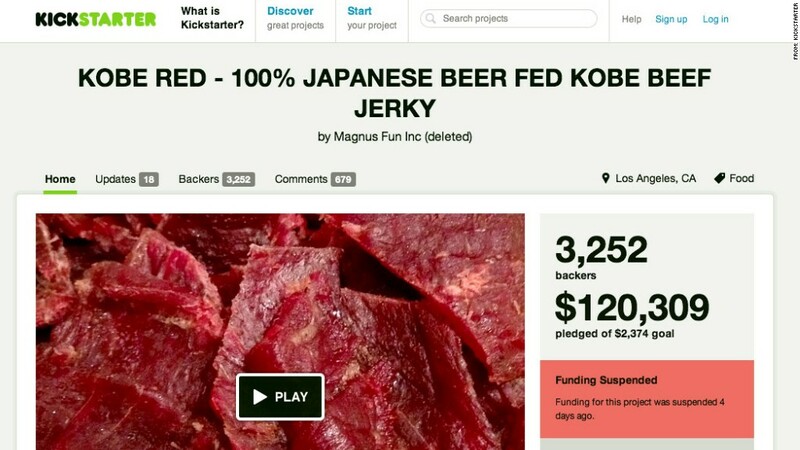 A company calling itself Magnus Fun nearly scammed Kickstarter backers out of $120,000 for what they claimed was the "first 100% Japanese Kobe beef jerky." Kickstarter fraudsters hawking Kobe beef jerky were just minutes away from completing the biggest-ever outright scam on the crowdfunding site last week. A campaign titled "KOBE RED - 100% JAPANESE BEER FED KOBE BEEF JERKY" first appeared on Kickstarter on May 14, and it raised $120,000 from 3,300 backers over the past month. That is, until Kickstarter pulled the plug just before the campaign was scheduled to end and the money was set to go into the fraudsters' bank accounts. Kickstarter relies on its community to self-police, and the Kobe Red shutdown came after sharp Kickstarter users and a documentary team raised concerns. The supposed company in charge, Los Angeles-based Magnus Fun, promised the jerky was the first kind made from the tender and expensive Japanese Kobe beef. Magnus Fun posted a decent amount of information on the Kobe Red page, including rave reviews from people who had supposedly tried the jerky -- "omg im licking my fingers in public," one alleged text message screenshot reads. The fraudsters also included information about imported meat inspection, and they posted a story about one of its founders eating Kobe beef on his uncle's ranch. But Magnus Fun also raised a few eyebrows. They didn't post much personal information, nor did they include photos and videos identifying themselves (which Kickstarter recommends as best practices). And when a Kickstarter user raised concerns in the campaign's comments section, Magnus Fun didn't really try to defend itself. The scam concerns took off when the team from "Kickstarted," a documentary about Kickstarter, looked more deeply into the campaign. The "Kickstarted" team highlighted problems with the Kobe Red page, including discrepancies between the high cost of production and the low pledges requested from backers. The documentarians also pointed out the comments from people swearing that they'd tried and loved the jerky all came from relatively new accounts that had backed only failed projects. In a long post on their own site about their role in exposing the Kobe Red scam, the "Kickstarted" team says they reached out to Magnus Fun with an interview request for the film, and Magnus Fun went back and forth for a bit before promising instead to send footage from a recent taste test in California. "Kickstarted" said it uncovered "dozens of other smaller inconsistencies and fishy elements" that were enough for Kickstarter to shut the campaign down. Magnus Fun has since deleted its Kickstarter account, and Kickstarter itself declined to comment on this story. "It's a credit to Kickstarter and the collective power of the crowd to identify fraud," the "Kickstarted" team, which also posted on Reddit about its concerns, wrote in its blog post. But it's also a sobering reminder that even feel-good programs like Kickstarter come with serious risks, even beyond straight-up frauds like this one. Last year, a CNNMoney investigation found that 84% of Kickstarter projects don't ship on time. In other cases, products have failed to materialize after creators promised more than they could deliver. Kickstarter projects have raised $571 million to date, and as with any major platform for raising money, scammers will try to bilk well-meaning backers out of serious cash. In the case of Kobe Red, they very nearly got away with it.